Want to feel the warmth of the sun on your skin and the cool breeze of the Pacific Ocean rustling your hair while taking a leisurely stroll down a road lined with palm trees and buzzing with life and activity? Or are you in a mood to go on a crazy shopping spree and use those credit cards that you’ve been longing to use? Well, just head down to Rodeo Drive in Beverly Hills, Los Angeles to see the high-end fashion come alive that will spice up your vacation in California. Known to be the Sunshine State, California holds the famous shopping street which is the world renowned Rodeo Drive in Beverly Hills. The name Rodeo Drive came into existence during the 1700s where the people living in that area considered it to be a holy place, because it provided the people with food and water in abundance. Therefore, they named the site as “the gathering of the waters” which when translated into Spanish is “El Rodeo de las Aguas”. 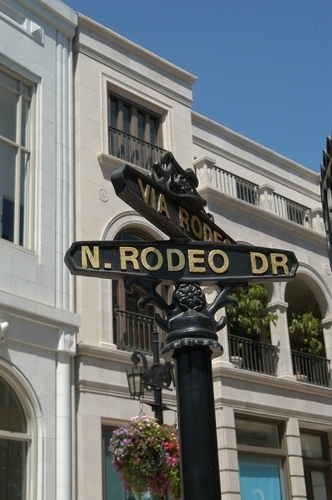 The Spanish term Rodeo is used to this day as they call it the Rodeo Drive. During the following years Rodeo Drive became a booming area for business and today it has become a famous tourist attraction as it is the epicenter of all the famous designer boutiques, museums, art galleries, restaurants and much more. One could stand in awe at the architecture and the stunning interior decoration of these boutiques which holds the latest fashion trends and exquisite jewelry collections. Some of the world famous retail brands such as Giorgio Armani, Bvlgari, Christian Dior, Dolce and Cabbana, Escada, Gucci, Valentino, Lacoste, Versace, Ralph Lauren, Chanel and Louis Vuitton can be found here. It is no wonder that travelers from around the world come to Beverly Hills to shop at this famous location. This shopping and business district now extends from Wilshire to Santa Monica Boulevard. Even though Rodeo Drive is a significant and a famous tourist attraction there are many other locations in Beverly Hills that can make your stay enjoyable and exciting that will make you feel like a celebrity. Some of the other attractions are the Hollywood walk of fame, Hollywood sign, Universal Studios Hollywood, The Grove, Century City, the Beverly Centre, the Los Angeles Zoo and Catalina Island. To be able to make the most of every moment at Beverly Hills, stay at a Beverly Hills hotel and make sure to capture the excitement and magnificence of this dazzling town. For a much needed personalized experience Raffles L’Ermitage is the perfect 5 star luxury hotel that will cater to your every need. Located in a tranquil residential area, Raffles L’Ermitage hotel takes you into a world of enchantment and inspiration. As this hotel is conveniently situated in the heart of many tourist attractions, such as the Rodeo Drive this would be the perfect luxury hotel in Los Angeles to stay, enjoy and explore the shopping extravagance at Beverly Hills.